How to make Snow Ice Cream that tastes as creamy and delicious as the original. 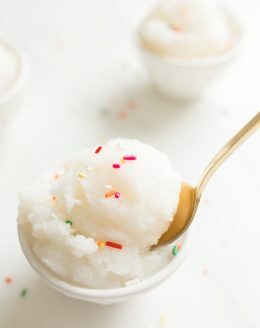 The best Snow Ice Cream Recipe to add to your snow day fun! Whisk milk, sugar and snow together until combined and sugar dissolves. Collect 8 c of clean snow. Pour mixture over the snow and whisk until well combined. Your result will largely depend on what kind of snow you have. If needed, freeze your snow for a few minutes first. If you have a wet snow, you'll use less milk / cream. A dry snow may use more. Start by adding a small amount of milk. After you incorporate the snow you can blend in more milk as needed. If the consistency is too runny, add more snow or freeze. Be sure to blend sugar into milk mixture first to help the sugar dissolve so it doesn't result in a gritty dessert. Make your mixture first before bringing in snow as it will quickly melt. You can always pop it in the freezer, if needed. To make this dairy free, use rice milk!